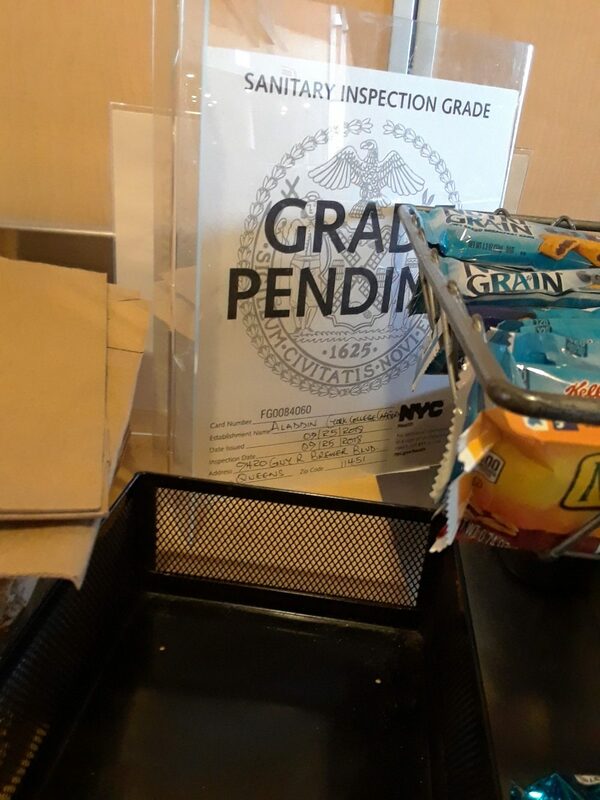 York College cafeteria pending grade sign hidden behind granola bars. Photo credit: Greis Torres. York College’s cafeteria racked up 37 sanitary violation points and had its “A” grade status reduced to “Grade Pending” after its last inspection on Sept. 25. 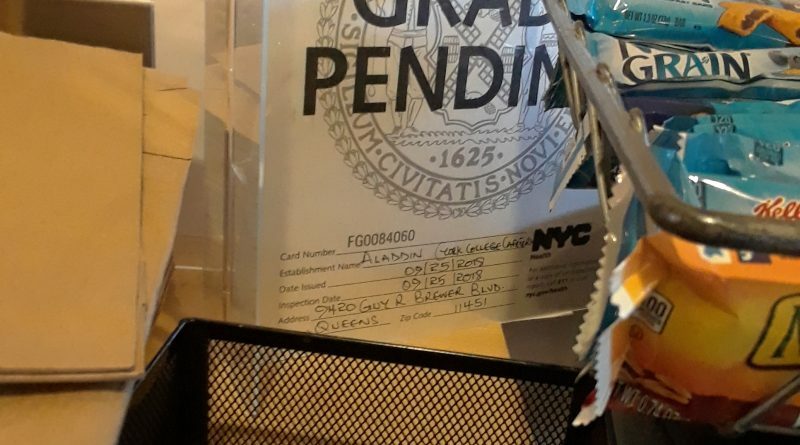 Restaurants and food establishments that get 28 or more points after re-inspection will get a C grade, according to New York City Department of Health and Mental Hygiene website. The cafeteria was hit with three sanitary violations, one critical which found the presence of filth flies or food/refuse/sewage flies in food and non-food areas. According to Vilardi, there was an equipment issue with the Pepsi coolers that created condensation at the bottom and other equipment that was causing backup between the drains. “It’s not actually an equipment malfunction, it’s actually the way the coolers were designed,” said Vilardi who added that he put in several work orders to Buildings and Ground to get many other equipments fixed. The other sanitary violations involved findings that the cafeteria is not vermin-proof, the plumbing is not properly installed or maintained, equipment and floors are not properly drained, and the sewage disposal system is in disrepair or not functioning properly. Lack of the required anti-siphonage or backflow prevention was also cited. Vilardi stressed that the violations were primarily related to structural problems at York, which is essentially the cafeteria’s landlord. “We only do food, and if you look at it there was no problem in any of our food preparation, or any of our food temperatures or anything like that,” said Vilardi. An earlier inspection on Sept. 13 cited the cafeteria for storing food above the required 38-degree limit and not providing proper sanitization for utensil ware, but those violations were corrected before inspectors returned on Sept. 25. According to the Health Department’s website, every restaurant gets two inspections. If the restaurant doesn’t get an A for the first inspection, then it’s ungraded and another inspector will have to go unannounced to the location within a month. In the second inspection is where the restaurant gets a final grade. But officials said York’s cafeteria will get re-inspected a third time in December. Food establishments that do not perform well will get re-inspected every month until they get 28 points or less otherwise they will be closed down, according to NYC Health. In the fall of 2016, a raccoon was found inside the cafeteria gates when it was closed. 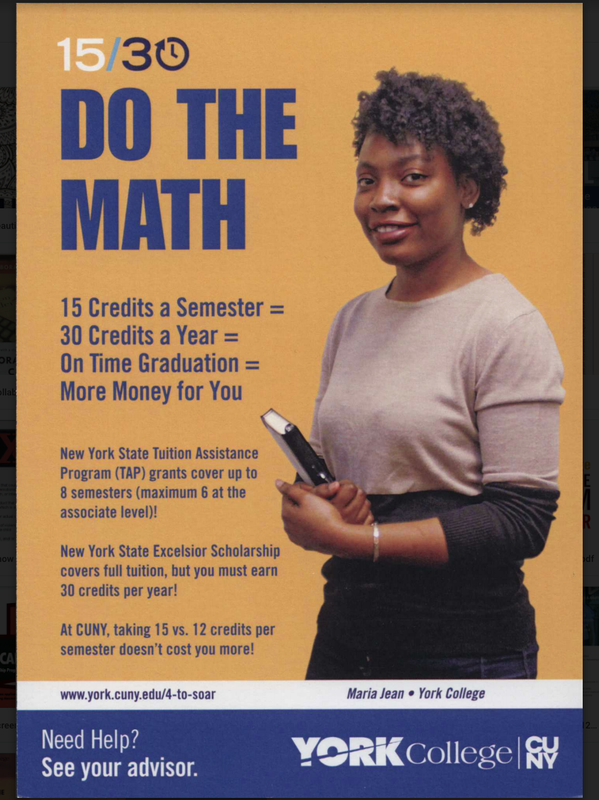 Another sighting of a raccoon occurred during the spring of 2017 when a photo of a raccoon peeping through a hole in the ceiling near Public Safety was posted to the York College app. The cafeteria got 12 violation points on September of 2017 and an A grade. The critical violations for that inspection included inadequate personal cleanliness, outer garment soiled with possible contaminant, hair restraint not worn in a food preparation area and food contact surface not properly sanitized. In November of 2016, the cafeteria got its record of 39 points in the initial inspection. The critical violations included hot food items being held below 140º F, cold food items being held above 41º F, evidence of mice present in food and non-food areas, inadequate outer garment cleanliness and food contact surface not properly sanitized. On the re-inspection conducted on December of 2016, the cafeteria was only hit with 10 points with the only critical violation being hot foods not being held at or above 140º F.
The latest inspection results show that in 2015 the cafeteria again got 10 violation points, which accounts to an A grade, with the only critical violation being cold food items being held above 41º F.
That same year, an Instagram video showed three rodents running around in the dining area near the cafeteria. The Department of Health didn’t reply to a request seeking comment.